On April 23, 2016, the Holy Metropolis of Germany held an official memorial church service in honor of all the Orthodox victims of the Nazi Concentration Camp in Hersbruck, Germany. In his address, Protopresbyter Apostolos Malamousis emphasized the symbolic importance of the joint participation of Bavarian students and those of the Greek community. It is well known that, at the Nazi Concentration Camp at the town of Hersbruck, near Nürnberg, some of the prisoners were Greeks, who underwent torture and, in many cases, breathed their last there. 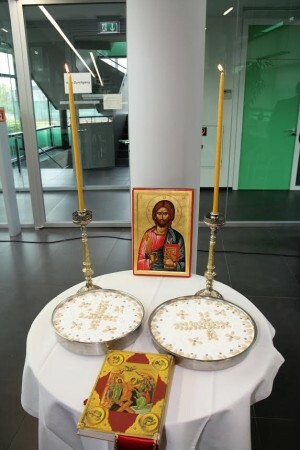 The Holy Metropolis of Germany held an official Church service on Saturday, 23 April 2016, in memory of all the Orthodox victims in this camp: Greeks, Russians, Serbs, Romanians and Bulgarians. The ceremony took place at what is today the Tax Office, which was built on what was the site of the Gestapo and the shacks for the prisoners, which were pulled down in 1949. Fr. Apostolos leads the way to the place for the wreath-laying ceremony. In the centre, the President of the Greek Community of Nürnberg, Mr. Konstantatos, on the left Mayor Ilk, Curator, Herr Föller, the Genral Consul, Mr. Konstantinoupos and the Vice-President of the Bavarian Parliament, Herr Mayer. In the courtyard of the Tax Office, there is a large stone, a remnant from the concentration camp. This stone is a historical memoerial and is the place where the people of the town come to lay flowers and wreaths to honour the victims of Nazism. The choir of parish of the Dormition of the Mother of God sang the requiem hymns. The President of the Greek Community of Nürnberg, Mr. Konstantatos giving his address after the wreath laying. Bavarian students from the town’s Middle School enhanced the event with classical requiem music and the reading of texts from the Orthodox requiem service in German. The presence of young Greeks from the various regional associations of Nürnberg, in traditional costume, was particularly impressive. Senior representatives of Bavarian society honoured the event with their presence and gave brief addresses. Young Greeks and Bavarians. The young lady on the left of Fr. Apostolos is the Bavarian student Stefani Witzgal, who also addressed the official guests. The curator of the of the Institute of Bavarian Places and Museums, Herr Föller warmly welcomed the initiative on the part of Fr. Apostolos in organizing the event and made reference to the criminal Nazi ideology and to the fact that two Greek priests, Archimandrite Meletios Galanopoulos and Archimandrite Damaskinos Hatzopoulos were interned in the Dachau Concentration Camp. Archimandrite Meletios was the parish priest at the Salvatokirche, in Munich. Other official Bavarian speakers were lavish in their praise for the initiative to preserve- through this event- the memory of the victims of Nazism and to pass on to young people the anti-Nazi message. The Greek State was represented by the Consul General in Munich, Mrs. Panayiota Konstantinopoulou, who, in her speech, referred to the meaning of Memorial Day. Many other local Greeks were also present. The President of the Greek Community of Nürnberg and surrounding districts, Mr. Dionysios Konstantakos laid a wreath at the historic memorial site, accompanied by young Greek people from the various Greek regional associations and all the official guests. After the event ended, a reception was held, featuring Greek olives, wine and Bavarian bread. In the town of Herbruck, in Bavaria (between Nürnberg and Lauf, there are remains of Hitler’s concentration camp, which functioned as an extension of the famous and much larger concentration camp at Flossebürg, Bavaria. The kollyva prepared by the Greek Orthodox Parish of the Dormition of the Mother of God, Lauf, Bavaria. In July 1944, on a hill close to the town of Hersbruck, Hitler ordered tunneling to commence on underground arcades and passageways for the construction of engines for military aircraft. His plan was to construct an underground factory and site of the order of 120,000 square metres. For the construction work, he brought thousands of prisoners at other concentration camps, particularly Flossebürg, to Hersbruck, housing them in mere shacks and creating a new camp. It is estimated that from June1944 until the end of the war in 1945, more than 9,000 prisoners stayed at the camp, which was a staging-post for the gas chambers. About 4,000 prisoners breathed their last there, among them many Greeks and Orthodox from other countries. After the camp was liberated, it was used as a detention centre for officers of the Nazi police, the Nazi army and their relations, and later as a reception centre for refugees. In 1949, the then Bavarian Agriculture Minister, Alois Schlögl, visited the town and said in a speech: ‘We want this disgusting part of a despicable period to disappear once and for all from the face of society’. All the shacks were immediately pulled down. A few years later, however, local society wished to revive the historical memory and, at the same place, created a memorial site in honour of the victims. Thereafter the Bavarian state constructed a small Memorial Museum, of an instructional and educational nature, for visitors to the site and, particularly, for young people. Featured Image: The Mayor, Herr Ilk, the Vice-President of the Bavarian Parliament, Herr Meier, Fr. Apostolos, the Prefect, Herr Kronter, the General Consul, Mr. Konstantinopoulos, the Curator fo the Bavarian Remembrance Museum, Herr Fröller,, the Member of the Bavarian Parliament, Herr Dinkel, Archimandrite Titos Yannoulis, the President of the Greek Community of Nürnberg, Mr. Konstantatos and the Chairman of the Victim’s Association, Herr Vrens.